Game 3 of AL Division Series between the Red Sox and Cleveland Indians has been postponed by rain and rescheduled for Monday. 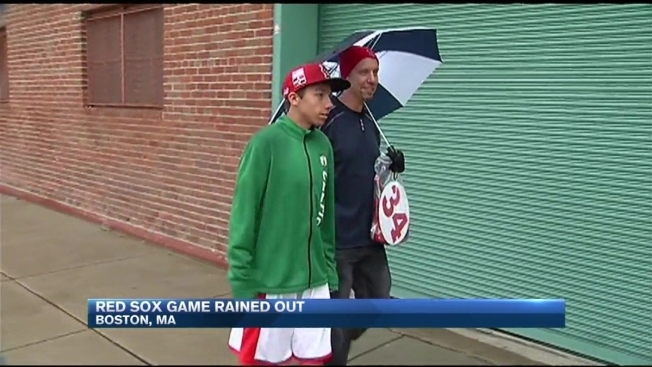 Red Sox officials said the game will resume at 6:08 p.m. at Fenway Park. Tickets for Sunday’s game will be good for admission to the rescheduled contest, according to Red Sox officals. The protective plastic sheeting from Toronto's end-of-season celebration was still covering the lights in the visitor's clubhouse at Fenway Park on Saturday. No reason to take it down. The Red Sox had a team meeting to discuss putting the game 1 and 2 losses behind them and preparing for game 3 in Boston. Clay Buchholz, Brock Holt, and John Farrell recount the meeting. They might need it again pretty soon. The Cleveland Indians arrived in Boston with a 2-0 lead in their best-of-five AL Division Series and a chance to eliminate the Red Sox in Game 3. If they do, it will also be the end for Boston designated hitter David Ortiz, who will retire at the end of the season and will do everything he can before then to make sure that doesn't come quite so soon. 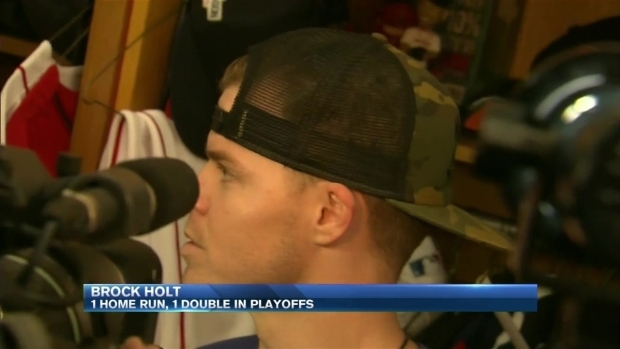 "Everybody had it mapped out in their head in spring training what we wanted to do, knowing that David was not going to be here next year," said Red Sox starter Clay Buchholz, who will try to keep the season going. "We reached the first goal, and that was to get in the playoffs and win the division. Second part of it has not worked out the first two games, but I don't think there's anybody on this team that's more confident than David Ortiz about us moving forward. "And whenever he comes to bat, he would love to put himself in the most pressure-packed position," Buchholz said. "That's just what he's done over his career." After Cy Young candidate Rick Porcello and ace David Price failed to beat Cleveland in the first two games, Buchholz (8-10, 4.78 in 2016) will try to slow down an Indians offense that already has four homers in the series. He will face Cleveland right-hander Josh Tomlin (13-9, 4.40), a former teammate from Angelina Junior College. "This is a pretty cool story," Buchholz said. "We talked about it the other day. He's one of my good buddies. ... It's a small world when it comes to that." Tomlin said the two pitchers get together in the offseason and have been back to the school in Lufkin, Texas, to work out with their coach. When their teams play, they sometimes hang out or go out to lunch. This year, they've had more to talk about than just their school days: Each of them has struggled this season and was bounced from his team's rotation. After going 0-5 with an 11.48 ERA in August, Tomlin made his next appearance out of the bullpen and didn't start again until Sept. 14. "The idea was to give him maybe a little of a break," Indians manager Terry Francona said. "I think what he actually did was he dug in and tried to figure out, 'OK, what makes me a good pitcher and why?' And I think he probably got to it quicker than the rest of us." Buchholz spent more time going back and forth to the bullpen, with 21 starts and 16 relief appearances. But he returned to the rotation in September and went 3-0, allowing two runs or fewer in four of his last five starts. "He's had a resurgence of his own right inside the season," Red Sox manager John Farrell said. "I don't think anyone can fully appreciate all that he's been through this year. (He) needed a little bit of a breather from the rotation, worked out some issues while going to the bullpen and has returned and is pitching some of the best baseball, I think, in his career." The Red Sox had a meeting on Saturday - players and coaches - after arriving at Fenway, and Buchholz said the team needed a reminder of what brought it so much success this season. "We're here because of everybody and what they've done throughout this year," he said. "We have a potential couple of MVP candidates, potential Cy Young candidate on this team. We're a really good ballclub and there's no need to put added pressure or added stress on one game because of what could happen." Across the diamond, the Indians were loose, thanks to their two-game lead. Francona arrived in the media interview room at the same time as Tomlin and promptly rearranged the schedule to let his pitcher go first. He then asked him, "Are you getting a Texas-to-English translator?" When Tomlin stuck around to watch his manager's interview, Francona said something nice about the 31-year-old pitcher and then said, "I think I'm going to throw up." Even with the joking around, reliever Andrew Miller said the team knows it still has work to do. "We can't take our foot off the gas," he said. "We're not celebrating at this point." The details of a potential Game 4 on Tuesday are to be determined. Until then, Tomlin and Buchholz won't be having any meals together. "Yeah, I'll text him tonight," Tomlin said. "Not tomorrow. But the next day after that? Yeah."